In Perfect Pairs Blackjack, you can count on one thing – the dealer always hits on soft 17. As for things on your end, you can split your hand whenever you get dealt a pair, and you can even split aces, but split aces only get one more card before you must stand on that hand. You cannot re-split in this game unfortunately. Doubling down is available at a cost equal to your ante bet on any two cards. 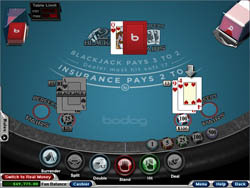 Insurance is available at a cost equal to one half of your ante bet when the dealer shows an ace. All bets push on a tie. To be eligible for the Perfect Pairs Bonus Payouts, you must make a side bet. Your bets in Perfect Pairs Blackjack must be somewhere between 1 and 250 USD/GBP/Euro, and all bets are made with a combination four chips – 1, 5, 25, and 100. When you win with your standard bet, blackjack will pay out 3:2, insurance will pay 2:1, and a standard win pays even money at 1:1. All bets push on a tie. If you play two hands, you ante separately for each hand, and you can bet different amounts if you like. The game designers who came up with and built Perfect Pairs Blackjack definitely knew what they were doing. The graphics are the best in the business, looking as realistic as they possible can without being actual photographs. The game plays fast and smooth, even on the oldest systems. The game provides a great view of the table, so you don’t miss out on any of the action. The chips, cards, buttons, and other important elements stand out strong and are easy to see, so you are never left ondering what to do next. Anyone can play this game, and everyone will be impressed by it! Perfect Pairs Blackjack side bets are tricky things. They can pay out big, but like all big payouts, the odds are low. The lowest payout, however, gives you 6:1 payout for just getting dealt a pair. This actually happens pretty often, so if you’re willing to wager a bit on the side, it can definitely pay off! Especially on those rarer occasions when you get Colored or even Suited pairs! RTG software is to be congratulated for Perfect Pairs Blackjack. This is perhaps the best Perfect Pairs blackjack game available today, both in terms of gameplay and graphics. Not only that, it’s great fun to play too! If you are looking for a good Perfect Pairs game, try this one on for size!